US military veterans are entitled, upon their death and after meeting certain eligibility requirements, to a headstone or grave marker provided by the Veterans Administration. If you are the spouse of a veteran would like a matching veteran headstone, here are some options to consider on this page. Many of the newer cemeteries utilize flat or grass level markers in their memorial parks. As a result, flat bronze markers are very popular. This represents an opportunity to offer several options for the spouse’s matching military headstone. When husband and wife are buried side by side there are a couple of options. Let us assume, for the purpose of this article, that the husband is the deceased veteran. 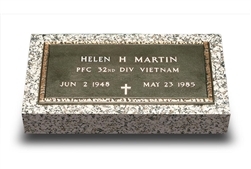 If the husband’s bronze VA grave marker has already been ordered and placed on the ground, then you can purchase a matching bronze grave marker with its own granite base for the wife. An individual VA bronze grave marker works perfectly for the spouse if the husband's grave marker has already been set on the grave. These markers are also available with a flower vase that is usually placed at the top of the grave marker in the granite. In the event that the bronze grave marker has not yet been ordered or installed, you can purchase a veteran’s companion marker. This type of configuration utilizes a granite base long enough to accommodate two individual veteran bronze grave markers. It can be ordered with or without a vase. This type of memorial is shipped with the wife’s bronze marker already mounted to the granite base. If she is still living then the dates will be cast on scrolls (mini plaques attached to the larger bronze marker by screws). The place for her date of death will be drilled and tapped to accommodate the final date at the time of need. In most cases the cemetery will install the husband’s marker on the granite then the whole grave marker on the grave spaces for a fee. This is basically a variation of the companion veteran’s grave marker in that instead of the two graves being side by side they are one on top of the other. Companion graves are usually done this way to reduce the expense involved in burial. 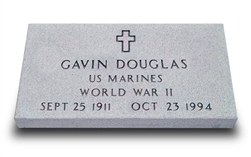 A double depth bronze gravemarker is basically the same except for the way the markers are situated on the granite base. If the husband has a granite VA headstone as his memorial then there is really only one option to match. A granite grave marker is engraved by means of sandblasting the lettering onto the surface. The typical format for lettering a VA headstone is with no punctuation. They also come with your choice of an emblem of faith. If the veteran was cremated and placed in a columbarium within the cemetery then a veteran bronze niche plaque is what they will need. The size is 8-1/2” x 5-1/2” and the Veteran’s Administration will furnish one to the deceased veteran’s next of kin to place on the columbarium front.